Even though CSS3 has brought a lot to the table in regards to drop shadow effects, there are still plenty of reasons to use image alternatives. 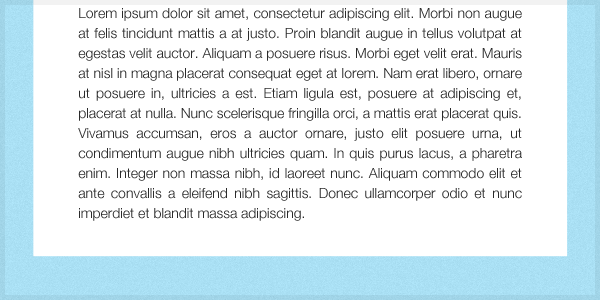 The drop shadows generated by CSS3 are relatively uniform, and don’t deviate much past size and transparency. In some cases, you might want to give a page some extra depth. I ran into a similar situation in a recent client project, and decided to use a recent trend of warping drop shadows to help add some extra excitement to the page. You might have seen similar effects in other tutorials involving deleting a circular section, but this method will keep the edges from being too sharp. It also allows you to work with non-rectangular shapes because all points are editable in the warp tool’s grid. Start a new Photoshop document. The size doesn’t matter because all of the elements will scale accordingly. I recommend changing the background color to something that will make a white box stand out, but not drown out a black shadow. We’ll use a light blue for the example. Draw up a white box and we’re ready to start on the shadow. You might be tempted to use blending options right now. Resist the urge, because we’re aiming for something much more distinct. Start by making a new layer that is positioned between the background and content box from the previous step. 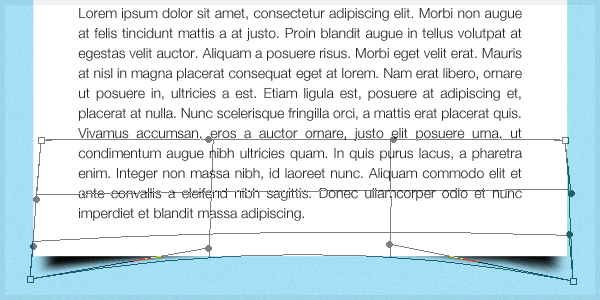 On the new layer, draw a rectangle selection that is just slightly smaller than the width of the content box. Fill this area with black. 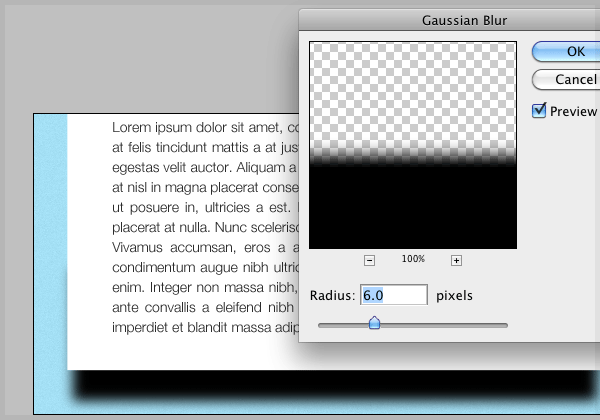 With the black rectangle layer selection go to Filter>Gaussian Blur and set the radius to 6 pixels. Photoshop’s warp tool is wildly underrated. It’s good for much more than messing around with celebrity faces or other random attempts to doctor photos. It’s particular good at taking specific shapes and molding them into another shape without ruining the appearance. This point is exactly why we’ll use it to shape our new drop shadow. With the shadow layer selected, head to Edit>Transform>Warp to bring up the warping grid. Use the handles on this control to give a curvature to the blurred rectangle. Feel free to shift the layer around to get the best positioning. Once the shape is set, simply lower the layer’s opacity down to about 15% and you’ve got a finished shadow that simulates a subtle page curl. Nice work! 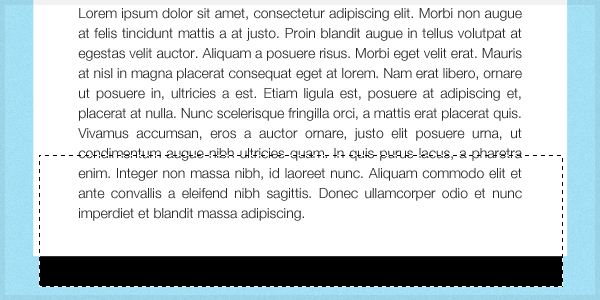 There you have it, a drop shadow that gives content areas a feeling of “coming off the page” depth. 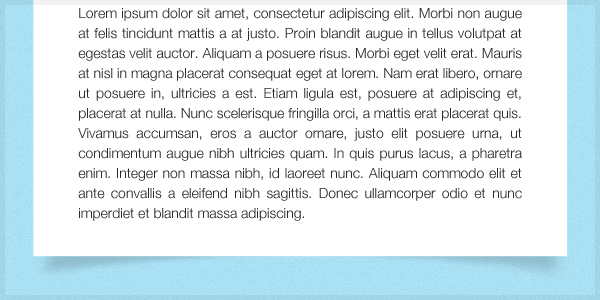 As you might have guessed by now, this is a perfect footer background for content areas throughout the page. Not bad! Nice and fast tip, didn’t think of solving this way..
I’ve been using this technique for years! Great effect! I like. Subtle and simple to make, yet powerful. Is such a warped shadow effect possible using CSS3? I’ve not tried it, but I think you could probably simulate the effect in CSS3 with rounded corners, inset box shadow and a negative top margin on a div (or some other element) below the element to be shadowed. hey if you use photoshop CS2 or above this is a nice way. Transparent Shadows ARE possible with CSS using the rgba() keyword (not supported in all browsers). Just for info. could this ‘other’ paint program produce a similar effect? A version for windows is available too. Looks really nice, like a sheet of paper on the table, thank you! That is definitely a nice way of adding depth. Bravo. Good tut. In my opinion it works very well with a semi-transparent white to gray(silver) overlay. Very quick tip congrats ! Hats off to you sir. That’s very well done. This is a much easier way. Thanks! @Max, @Jerome posted this awesome link http://jgn.heroku.com/2010/06/19/warping-drop-shadows-with-css3/ on how to achieve that with CSS3. Back in March, we introduced wholesale nfl jerseysyou to the Nike 78 project. Brilliant little tutorial! Takes 10 seconds and gives big pay-off in design. @Anupum – I actually agree. Tried this and it does seem a bit more ‘natural’. Thanks for the tip. you are amazing! I have been trying to figure out how to do this forever. Never knew what to search for and stumbled across this when searching for alternatives to drop shadows. Thanks so much for sharing!! Excellent, was searching for the same. This tutorial was a lesson in why I’ve learned to never say “impossible” regarding web technologies. Thanks for the link! Opps reading the comments I can see other people already got to the point (Darn why can I never be the first? Haha!) Sorry about that. wow, i always wanted to know a easy way. thanks! I would recommend adding some shading to the corners of the “paper” itself. Just putting a warped shadow below a flat white square does not give the impression that the flat square is curved, but rather that there is a curved shadow for no real reason. I’ve seen this effect on too many sites now and it is becoming like lens flare to me. i expected it would be a big job. u don’t know how much i need this tutorial!!! It was really simple and stupid thing that I always love.